Big Rigs 'n Lil' Cookies: Mmmmmm... Chili! 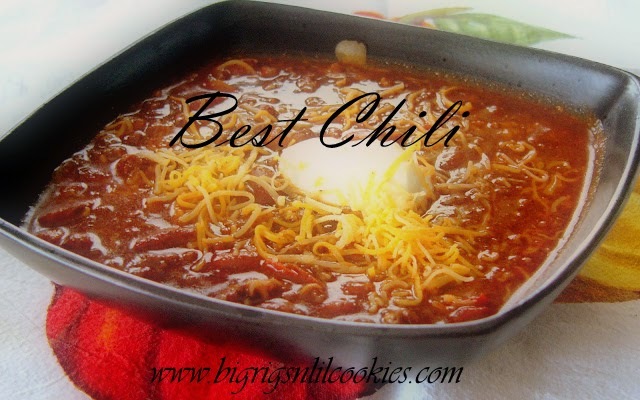 Chili is definitely in my "Top 10" of favorite foods. It's simply yummy, warming, filling, and really one of the meals I eat a lot when I am trying to make up for the Christmas goodies. It also helps me feel good about things before I start in on the Valentines Treats! Of course, when you have temperatures hanging around zero, it's just awesome for warmin' a girl up! I never used to have much of a recipe for chili, I would just throw it together, or use a chili mix from the store. That was the case anyway, until I came across this recipe years ago on allrecipes. I just love the flavors, it is so perfect. Since the chipotle's go through the blender, you don't have any bites filled with strong heat, just a nice consistent warmth throughout. I do typically leave the jalapeno out for dear boyfriend, as he isn't a fan of to much heat. Also, to keep things in more his line of heat, I do remove the seeds from half of the chipotles. It ends up with a nice heat level that we both agree on. This freezes really well, too. Over medium-high heat, cook beef/venison til brown. Drain. Stir in onion and peppers; cook til tender. Stir in garlic and cook 1 minute. Add chili powder, cumin, salt and pepper. Stir in tomato paste and beans. In blender, puree tomatoes with chipotles til smooth. Stir into the pot with 3 c. water. Combine the remaining 1 cup water, with the flour in a jar and shake to combine. Pour into chili. Add vinegar. Simmer about 1 hour before serving. Garnish as desired! This sounds like a good recipe. I am always open to trying new versions of chili.Thanks for brining it over to Tumbleweed Contessa's Superbowl Party and Chlil Cookoff. Mmmmmmmm! This sounds good. I'm in the mood for a rich chili for dinner. I like the idea of the acidity of the vinegar. Thanks for bringing this to our Super Bowl Party. I'm sure it will make a great hit! G'day! Perfect for the weather we are having at the moment, true! Wish could come through the screen and try some of this now too!